WARNINGS are starting to filter out to livestock producers in Queensland and NSW facing desperate feed and roughage shortages over toxicity risk associated with feeding drought-stressed sorghum crops. The development follows reports of recent stock losses in both feedlots and open grazing applications due to prussic acid and/or nitrate toxicity from drought-stressed sorghum and some other forages. 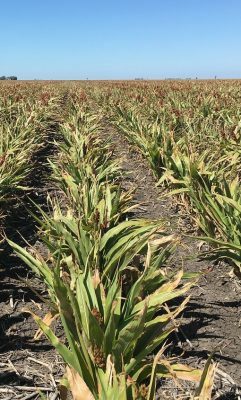 Lack of rain and extreme heat during January has pushed some summer forage and grain sorghum crops further into the ‘risk’ category, presenting the potentially dangerous problem of nitrate and prussic acid toxicity. Although uncommon in normal years, such poisonings occur when cattle eat forages stressed by severe environmental conditions, such as those being seen in the current drought episode. Drought-stressed forage and grain sorghum are most commonly associated with prussic acid and nitrate toxicity, but corn and even lucerne can also be affected by nitrate buildup. Although the growing conditions causing nitrate and prussic acid toxicity are similar, the challenges in management differ. The major difference between the two poisons is that prussic acid generally dissipates from plants if material is properly processed as hay, whereas nitrate levels remain constant in hay, technical notes suggest (see links at base of page). Nitrate poisoning acts on the oxygen-carrying capacity of an animal’s blood. When forages have a high concentration of nitrate, the animal cannot complete the conversion and nitrite accumulates. Veterinary advice suggests that cattle can safely eat forages that contain up to one percent nitrates on a dry-weight basis. Severe drought stress can also cause prussic acid to form in forages. Toxicity can accumulate and fluctuate in the plant, being present for a short time, but then dissipating. A prussic acid reading in excess of 600ppm is considered unsafe and 1000 ppm is lethal, tech notes suggest. PAC Seeds summer grains and forage business manager Andrew Short said forages can be tested for both nitrate and prussic acid levels, either as standing forage, stubble or hay. He said he did not think testing of drought-impacted forages was happening as much as it should be this summer, given the circumstances and associated risk. “Although instances of prussic acid and nitrate poisoning might not be common as a general rule, seasons like this really bring home the risks that can be out there,” he said. Mr Short said there was a misconception that forage sorghums presented a lesser prussic acid risk than grain sorghums when fed to livestock in drought years. Livestock producers desperate for feed this year might be considering utilising stressed sorghum crops in a number of ways – either abandoning harvest and feeding the failed crop in the paddock, or harvesting the grain and baling or feeding the stubble. “What’s heightened the risk this year is that with the general acute feed shortage that’s occurring, anything that’s out there and available is being considered as a feed source,” he said. Mr Short said growers were frequently seeking advice about potential crop risk to stock this year. “But there’s absolutely no way to tell by simply looking at the crop. Visually it’s easy to tell that a crop is stressed, but there is only one way to know definitively if there is a toxicity risk, and that is to test,” he said. Feedstuffs broker Tim Ford, principal of Feed Central near Toowoomba, said there had been a dramatic rise in testing of drought-affected sorghum samples for toxicity this summer – especially since December. “Our feed testing facility has been inundated, which is not surprising, given the conditions,” he said. Samples were coming from across the Darling Downs, the Lockyer Valley, South Burnett, the border region and sorghum-growing regions into NSW from Moree to Inverell. Agronomists were obviously worried about toxicity risk, and had been encouraging producers to test samples, Mr Ford said. Results varied from year to year, but this summer, at least 15 percent of test samples were coming back in the ‘risk’ or ‘high risk’ category, he said. Heightened risk could be seen in droughted cattle that might gorge themselves after being given access to sorghum hay carrying elevated levels of prussic acid or nitrate, especially if their liver function was already compromised, making it harder to screen out toxins. Feed Central has been working on the development of an in-field test for prussic acid and nitrate levels in crop samples. The new test went live this week. Previously, samples have had to be sent to a lab for testing, at times taking a week or more to produce a result – time which many drought-pressured producers could not afford. The new in-field test, in kit form, could analyse for both nitrate and prussic acid, Mr Ford said. The in-field test will deliver a ‘yes/no’ result for feed safety for both toxins, but did not deliver a ‘parts-per-million level’ like a laboratory test. “An important point with nitrates and prussic acid levels in stressed sorghum is that it often varies across a paddock, depending on soil types, low-lying areas which might gather moisture, or other factors,” Mr Ford said. “That’s why the test kit we have started sending out this week will be enough to do five tests,” he said. Feed Central plans to have 500 test kits assembled by the end of the week, to meet current demand. Do not allow stock to graze risky food sources. Have feed analysed if safety is in doubt. Feed hungry stock with hay before allowing them to graze forages which may contain high levels of nitrate/prussic acid. Provide sulphur supplement where possible to assist with the detoxification of prussic acid and toxins. Remove all livestock from the feed source when an animal is found to have died suddenly after grazing forages under poor growing conditions. If buying sorghum hay, make sure that it was cut during low-risk conditions, or get it tested. There is no decrease in prussic acid content in the process of haymaking. Feeding material as silage will reduce the risk of poisoning, as correct ensilage for three weeks reduces levels of toxin by about 50pc. On feeding out, some toxin will be released as gas. It is still recommended that this feed be tested prior to use. Green chop forage may be safer than the same plant material in a pasture because selective grazing of high-risk leaf material is prevented. To view a Departmental advice from the QLD Government on feeding drought-impacted sorghum crops, click here. Just to be clear (as there seems to be a typo in paragraph 6), prussic acid levels generally decline in silage but NOT in hay. This is similar to the risk of nitrate poisoning when feeding hay vs silage, as per the following information in the NSWDPI nitrate poisoning Primefact. Hay made from nitrate rich material contain almost as much nitrate as when first made, unless some is converted to nitrite by heating or mould. Forages can lose 40-60% of their nitrate concentration when made into silage due to the fermentation process.